- When switching, especially during descend, from VNAV/LNAV Mode to LNAV + SPD / VS the last selected SPD is not triggered. - While descending GCLA-EDDM with 260kts IAS and pressing "SPD" a speed of 230kts IAS was shown in the IAS/MACH Window. The last assigned and flown speed should be selected during this mode-change. Descend now doesn't seem to work. 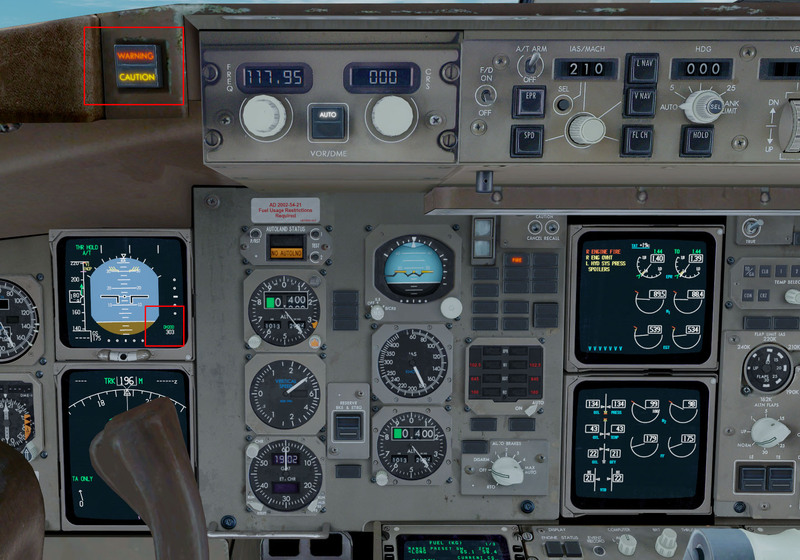 When the 757 is stopped at TOD, I unpause the sim, go to the descent page und dial descend now and enter. Nothing happens until TOD is reached. Shouldn't it start descent slowly before and then have a smoother descent? Currently, warnings are not suppressed as described in your documentation (Manual Part II, pp. 565–566) and Boeing's 757 FCOM (section 15.20.6) during part of the take-off phase. They erroneously illuminate and sound immediately, whereas – according to the manual – the Master Warning light and fire bell should be inhibited from lift-off until reaching 400 ft AGL or 20 seconds of elapsed time, whichever occurs first. If the condition still exists when the inhibit is removed, the fire bell and Master Warning light are no longer suppressed and activate immediately. The same goes for the Master Caution system starting at 80 knots and lasting until 400 ft AGL, 20 seconds after lift-off or IAS < 75 knots. Boeing states that within this period, faults or fires will only be presented silently in form of EICAS messages. 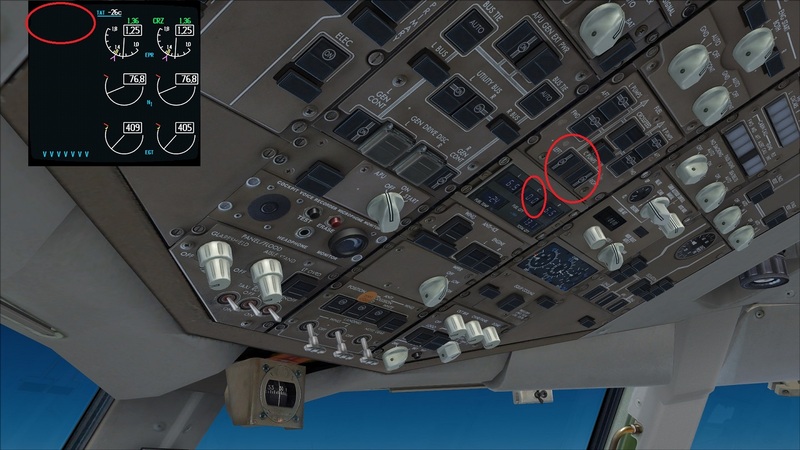 The attached screenshot shows the illuminated Master Warning/Master Caution light due to engine fire and low hydraulic pressure (accompanied by the respective fire bell and beeper) even though the aircraft is still below 400 ft AGL. The HOLD feature in the FMC is not working. The HOLD pattern is drawn on the ND but when the plane arrives at the holding point, it skips it and moves on to the next waypoint. After reinstalling the aircraft several times, completely deleting everything, including P3Dv4 too, It is the only aircraft I've had this error on... Just wondering why is this happening? After consulting the FCOM reading over it, I couldn't find anything like this, I'm so confused right now. Any assistance will be greatly helped, FYI it's running the latest version of 757 III too. I have followed the instructions in your manual part 2 from page 489 to page 493 "to the letter". When the plane approaches the holding fix, it simply skips it and continues on to the next waypoint. This has happened three times in a row. Something is wrong. This error message has already existed once, but probably not in the desired form. Nevertheless, this would have been easy to understand. I have prepared these again and hope it will meet the requirements, to eliminate them with an upcoming update. Can not you set several pictures here? Can Captain Sim fix a list of bugs that are recognized and fixed in an upcoming update? It is sometimes quite difficult to recognize on the individual pages, what should be remedied now despite listing and what may still be unclear and needs further explanation.